Side Note: One of the things that bugs me about summary blurbs is when they use part of the book as the entire summary blurb. It doesn't necessarily tell you what you're getting into. And it just seems kind of lazy. But that's what we did here. Of course, that's not really why I didn't really care for this installment of the series. Bradley crept forward between the tall narrow aisles created by the shelves. Just before he reached the corner he heard a thump, the sound of a body hitting the floor. He rushed forward into the corner of the room. The desk was empty. The chair was pushed up against it, neatly awaiting its usual occupant. No one was in the corner. No one was there to make the sound. No one…alive. A cold chill ran down his back. He really wanted to leave the room. Instead, he moved closer. He walked to the window and looked outside. Snow fell softly on the rooftops in the city of Freeport. It was Christmas Eve, a night of peace and miracles. He jumped around. The voice was just behind him. Even before he turned, he knew no one would be there. He rubbed the back of his neck, still cold from the breath that carried those words. The curse had killed another law enforcement officer in Stephenson County–this time it struck on Christmas Eve. Nearly a dozen good men had died in the past four years and they all had the same unexplained symptoms. And Mary knew Bradley was next. 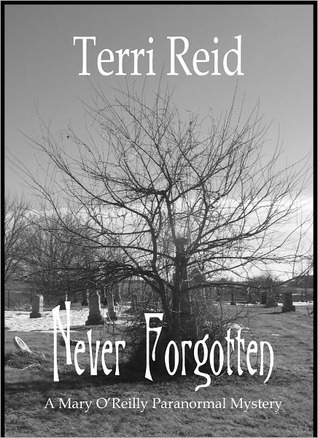 The writing style for Terri Reid's Mary O'Reilly mysteries seem to be getting better as each book comes out, which is a plus. However, this third book in the series doesn't seem to be as exciting as the first book (much like the second book wasn't as exciting). We've got a whole slew of mentally disturbed victim/murderers here who are a result of childhood traumas, resulting in innocently dead bystanders. The concept isn't so bad and DOES touch on the awareness of domestic violence, tying in with the mysteries. I'm not sure what made this book seem mediocre to me compared to the first or second one, but it just didn't seem to quite fit. Maybe it was the hanging progression of Bradley's closure on his wife's death and her insistence that Mary remain quiet about it. Maybe it was the too quick development of the love line, knowing very well that Bradley is still hung up on his missing wife. Maybe this particular murder mystery just didn't intrigue me as much as the first one did. Setting all of those aside, my two star rating doesn't mean that I think this book was terrible (the little hovering descriptions on Goodreads says that a two star rating equals "it was ok," which doesn't mean it was bad, which makes me wonder why the Goodreads ratings are so nice for some other books). I just didn't really like it as much as I thought I would. I still really enjoy the Mary O'Reilly paranormal universe and I still really love the characters Terri Reid has created in this universe. The two best friends, Stanley and Rosie are the epitome of wonderful. The introduction of Mike the ghost who has self-claimed himself Watson to Mary's Sherlock is also a delight. And a lot of the recurring town's characters are nice to see every so often (I like how this story is set in a small town where everyone knows each other well enough). But other than that, this particular book in this series didn't interest me very much, and that was about it. This review was originally posted at Goodreads in March 2012.